Hey guys! 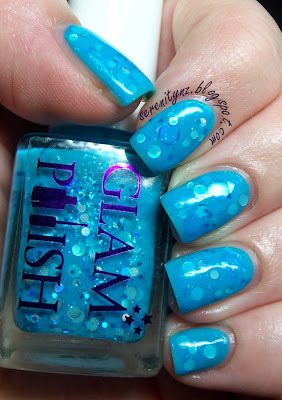 Today I have swatches of a couple of Glam Polishes. I'd been drooling over a few colors and finally strength failed me and I placed an order :) I am glad I did though, because look at these pretties! These swatches show two coats of 'She Had a Lipstick Taser' over two coats of China Glaze 'Bahamian Escape' with one coat of Jordana Quick Shine. 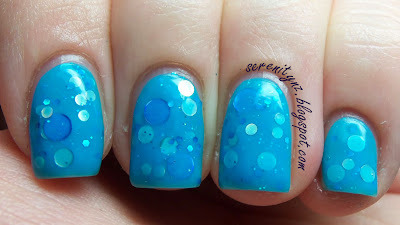 I did try building this to opacity alone but it took four coats, so I prefer it layered. The watermelon glitter in this is such a unique color - I don't think I have anything else in my collection with this particular shade of glitter. The combo of that with the blue base and smalller white glitter looked great - I really enjoyed wearing this one and am happy to have it in my collection. 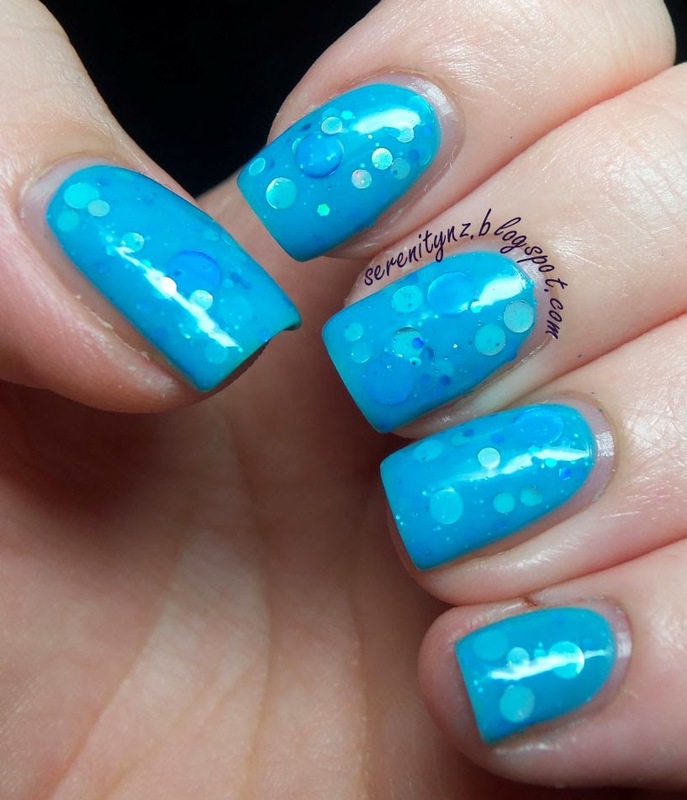 Bubble Breeze: 'Silver holo dots, large ocean holo dots & blue holo micro glitter in an ocean blue base'. This is from the 'Me Oh My Collection' inspired by all things cute & fun! The pics show three coats of Bubble Breeze with one coat of Jordana Quick Shine. Formula was good - not thick at all, but I did have to do a little bit of fishing to get the bigger dots out. How adorable is this though? 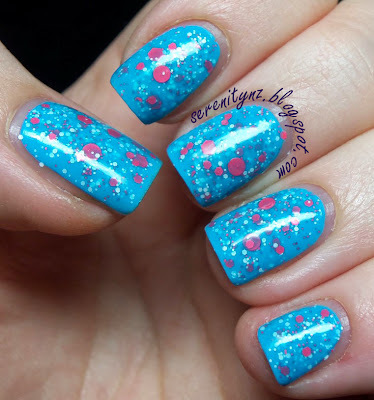 It actually looks like I have little pools of water for nails with bubbles floating round in them - I love the effect :) Circle glitter is always a winner with me! 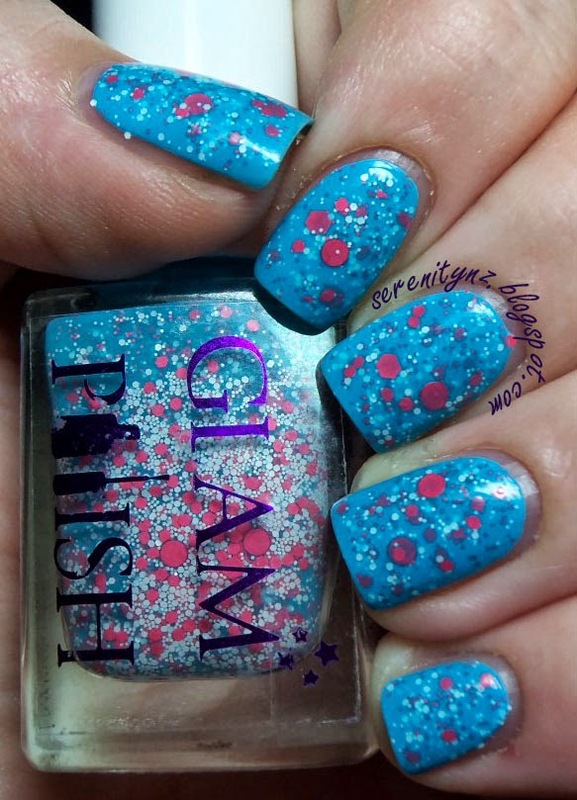 I picked these up from Llarowe as the Glam Polish website ships within Australia only. They are also available from the following retailers: Norway Nails, Color 4 Nails, Rainbow Connection and Mei Mei's Signatures.